This post is the second part of a five part story. If you haven’t read the previous installment you can find it here. Feeling empowered by the crampons on our boots, we quickly crossed a couple of streams on wooden log bridges, and then stepped back into snow. Then came the time to test our new-found confidence, as we started trudging up a steep hill. I’m pretty sure we lost the trail again, or perhaps we simply bypassed switchbacks. It’s hard to say with certainty, but we gained elevation rather quickly. 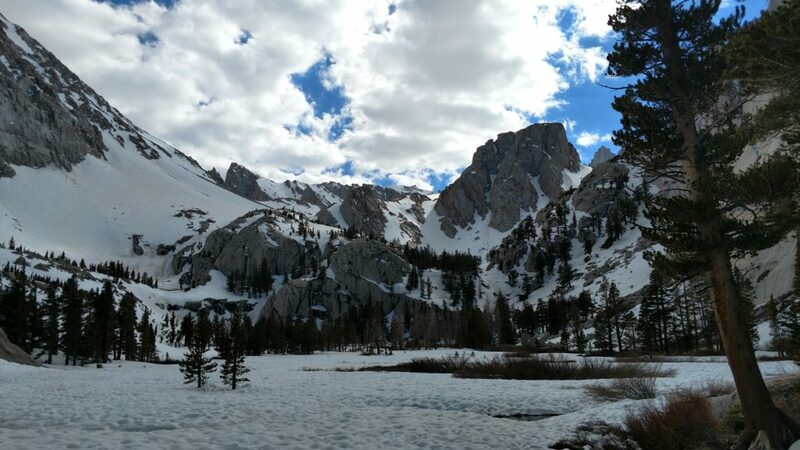 I think we skipped some switchbacks hidden by snow, because we gained elevation fast. This wasn’t easy hiking and even Tim, one of the most athletic people I know, seemed to be slowing down. Making our way up the second steep pitch, I felt this couldn’t be right. We must have gone too far. In an attempt to correct course, we veered right again making our way back down a steep grade. Were we lost? We had certainly lost the trail, but the direction felt right to all three of us. We pressed on. Tim and Jon following my lead back down a steep grade. Through all of this, we moved slowly. Snow lie several feet deep in some places; a hard icy crust had formed on the surface, but underneath the snow had taken on the consistency of a slushie in some spots. 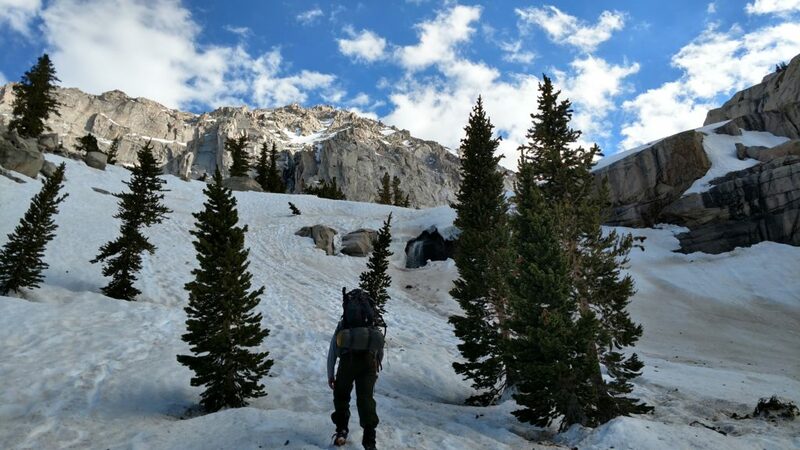 The clear skies and sun overhead had weakened the icy surface, making it easy to break through, sinking in to our ankles, our knees, and a few times even to our thighs. For those of you who don’t know, this is called postholing, and it makes walking slow and exhausting. The crampons helped tremendously, enabling us to gain traction on the icy surface, but we postholed regularly enough to slow our progress. The sun started to sink in the sky. In an hour’s time, we only put another mile behind us, if that. But the ground leveled off, and we started across Bighorn Park, a welcome reprieve from the uphill and downhill efforts. We hadn’t been lost after all. “Finally, we can make up a little lost time,” I thought to myself. We walked past a young couple setting up a campsite in a clearing. They seemed inexperienced, but friendly. We asked their plans, and they indicated that they intended to embark for the summit in the morning. “Us too,” I remarked, though doubts had begun creeping into my mind, questioning the plausibility of that goal. My optimism still urged me forward though. I hadn’t yet given up on the summit. At this point another hiker, introducing himself as Andrew, walked back from where he had taken a break. He wanted to check on the young couple as well, and we all struck up a conversation. Andrew had a lot of experience on Whitney; he has summitted six times before. 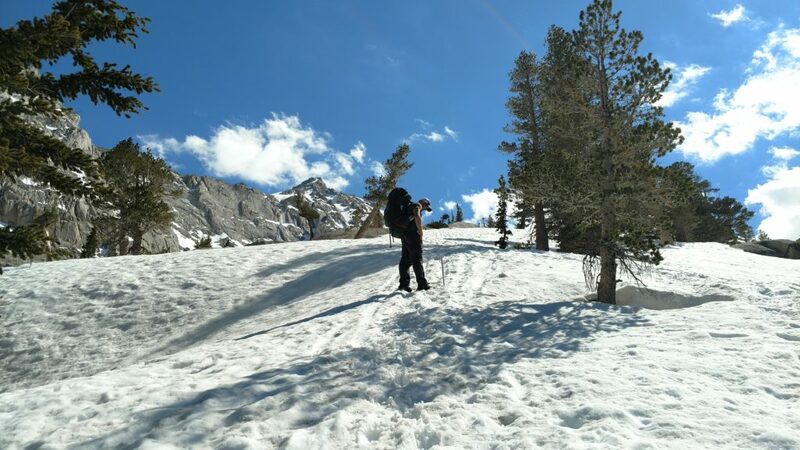 On this trip, he was scouting out potential skiing routes. 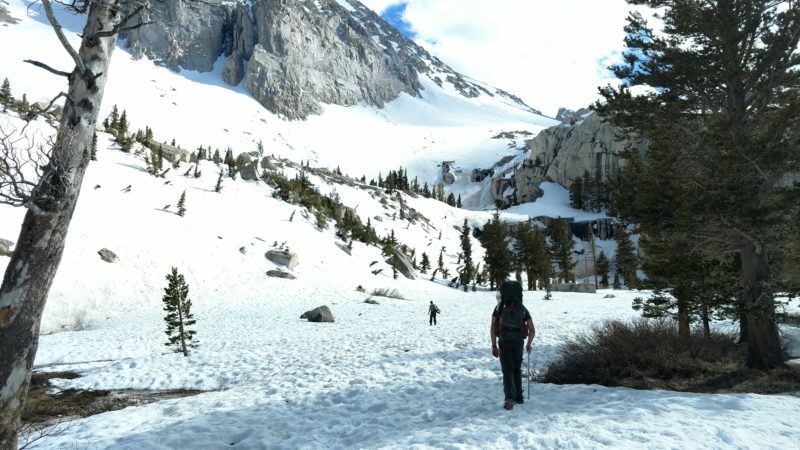 He believed that at roughly 10,000 feet and above, the snow could stay thick enough to ski, perhaps even through July! The six of us discussed the missing hiker. We hadn’t made it to her last known location, but we were getting closer. The conversation, paired with standing in the shade, gave me a chill. I longed to be underway yet again. So when Andrew told us he was headed to the same spot where we intended to camp that night, and suggested we all walk together, I was happy to accept. As we crossed the snowy plain, Andrew explained that he wasn’t taking the main route up, as we had intended. 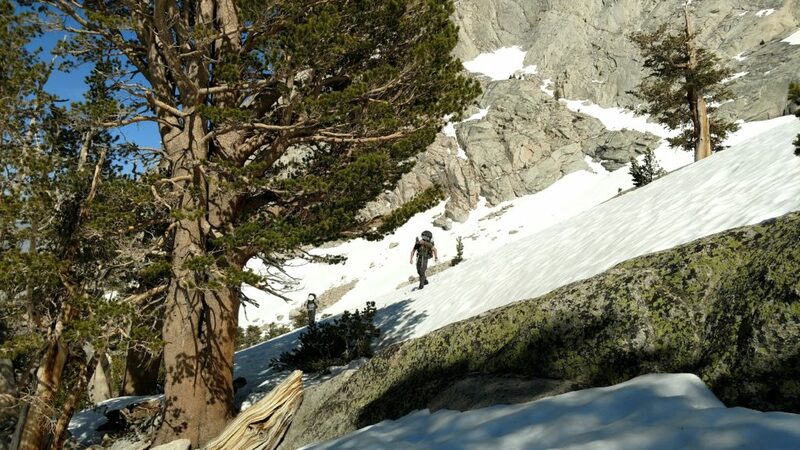 Instead, he planned to take a “snow route” to try to cut some mileage and time off the hike. The outfitter had mentioned people doing this, and I had a good feeling about Andrew. I trust my gut, and I none of my warning bells were going off. Tim, Jon, and myself had struggled to find our way, and Andrew exuded confidence in his direction. I felt comfortable with this call; we didn’t stop to discuss it, but my teammates seemed to agree. Following Andrew up the snow route. As we began to walk up a gradual rise, a helicopter came into view, circling us. “Four hikers, one with a red backpack, can you hear me? If so make the touchdown symbol.” Knowing that the red backpack must be my Taboche, I signaled that we could hear them. They reiterated details about the lost hiker, and then asked if we had seen her or any trace of her. I signaled no, and they moved on. I felt odd; was it wrong to enjoy my time on the mountain so much, while others suffered on the same peak? I chose to focus on the positive. I couldn’t change the situation, but I could remain alert to anything unusual I might see. Even as I consciously made that decision I wholeheartedly believed it unlikely that I would see anything helpful to the search. I felt certain that the search for Cindy and my hike remained entirely separate. I also still believed that we would be able to make trail camp that night. Soon I would see just how naive I was on both counts.